The small airport of Sant'Egidio is near Perugia, some 70km from Orvieto. There is no direct transport from Orvieto to the airport, or vice versa, so the only way of reaching the city from the airport is to hire a taxi or rent a car. . Some hotels can arrange a pick-up service. 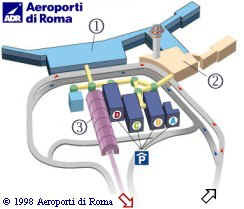 From Perugia, the airport can be reached by a bus that leaves Piazza Italia and the Fontivegge railway statrion. Parking at the airport is free of charge and all the main car rental companies have offices here (consult the section Car Rentals). The airport is served by a single daily flight that provides a connection to Milan’s Malpensa airport. The carrier is Minerva Airlines with a Fairchild Dornier 328 Turboprop.